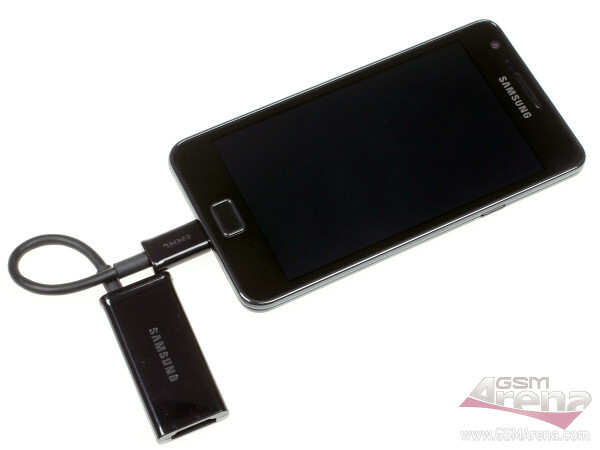 The Samsung I9100 Galaxy S II has a MHL port – the technology that combines USB and HDMI into the same port. This one is indistinguishable from a microUSB port and works like one with no problem (and as a charger port too). Plug-in an adapter however and you get an HDMI out as well. We got the optional adapter from Samsung, there isn’t one in the Galaxy SII retail box. The adapter plugs into the MHL port of the Galaxy S II and ends with a regular HDMI female port. There’s a microUSB port to plug in a charger. It took us a few minute to get the thing going – it turns out, the adapter won’t work unless you connect a charger too. After that, the content on the screen is automatically mirrored on the HDTV. Everything is displayed on the TV – even the homescreen. However, the long-standing problem of Android that it can’t rotate the homescreen horizontally means you only get to use a part of the screen when playing with the homescreen. Everything else works like a charm – like say, the browser or the image gallery. We also played a few videos (including FullHD videos) and the content was mirrored on the screen without requiring you to do anything extra. Subtitles worked too. Unfortunately, there’s no pricing info on the MHL adapter yet. And mind you, Nokia N8 and Xperia Arc users get one of these for free.